Francesca was an Italian artist of the Early Renaissance, known to contemporaries as a mathematician and geometer as well as an artist, though now he is chiefly appreciated for his art. His painting was characterized by its serene humanism and its use of geometric forms, particularly in relation to perspective and foreshortening. 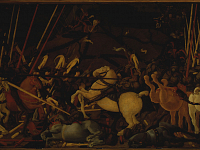 His influence was particularly strong in the later Ferrarese allegorical works of Cosimo Tura (1430 – 1495), as well as with Pietro Perugino (1446 – 1524) and Luca Signorelli (1445 – 1523). He was born and died in the small town of Borgo Santo Sepolcro in Tuscany and may have learned his trade from one of several Sienese artists working in San Sepolcro during his youth. It is known that Francesca later apprenticed in Florence with Domenico Veneziano (1410 – 1461), with whom he worked in 1439 on frescoes in the church of Sant’Egidio for the hospital of Santa Maria Nuova. He also knew Fra' Angelico (1395 – 1455), who introduced him to other leading masters of the time, Masaccio (1401 – 1428) and Brunelleschi (1377 – 1446). In 1442 he returned to Sansepolcro where, three years later, he was commissioned for an altarpiece in the church of the Misericordia, which he later completed in the early 1460s. In 1449 he executed several frescoes in the Castello Estense and the church of Sant'Andrea of Ferrara, now lost. Two years later he was in Rimini, working for the Wolf of Rimini - military leader and patron of the arts, Sigismondo Pandolfo Malatesta (1417 – 1468). In this sojourn he executed the famous fresco of Sigismondo Pandolfo Malatesta Praying in Front of St. Sigismund, as well as the Portrait of the Condottiero. There he also met another famous Renaissance mathematician and architect, Leon Battista Alberti (1404 – 1472). In 1452 Francesca was called to Arezzo to replace Bicci di Lorenzo in painting the frescoes of the Basilica of San Francesco. This cycle of frescoes depicting the Legend of the True Cross is generally considered among his masterworks and one of Renaissance painting in general. In 1453 he returned to Sansepolcro where, the following year, he signed a contract for the polyptych in the church of Sant ‘Agostino. A few years later, summoned by Pope Nicholas V (1397 – 1455), he moved to Rome, where he executed frescoes in the Basilica di Santa Maria Maggiore. He was later commissioned for frescoes in the Vatican Palace, now destroyed. To this period belongs The Flagellation (c. 1460), one of the most famous and controversial pictures of the early Renaissance. Other notable works of Francesca's maturity include the Baptism of Fire, the Resurrection and the Madonna del parto. At Urbino, where he was in the service of Count Federico II da Montefeltro (d. 1370), he met the artist Melozzo da Forlì (1438 – 1494) and mathematician Luca Pacioli (1445 – 1514). 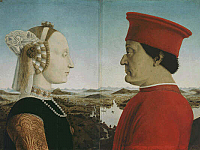 While in Urbino he painted the famous double portrait of Federico and his wife Battista Sforza, now in the Uffizi, The Duke and Duchess of Urbino, as well as the Madonna of Senigallia and the Nativity. His portraits in profile take their inspiration from Roman coins.